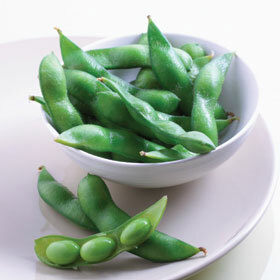 Edamame is a preparation of baby soybeans in the pod commonly found in Japan, China and Korea. The pods are boiled in water together with condiments such as salt, and served whole. Outside East Asia, the dish is most often found in Japanese restaurants and some Chinese restaurants, but has also found popularity elsewhere as a healthy food item. I like this Japanese treat as much as the next person but I wonder how many visitors go to http://www.edamame.com/, which is literally just a web page offering a definition of edamame and its nutritional information. More useful is http://www.foodnetwork.com/recipes/ellie-krieger/edamame-hummus-recipe/index.html, which has a healthy recipe for hummus made with edamame. I haven't tried it but it sounds interesting. I buy them frozen and make them at home, which is really easy and much cheaper than ordering a tiny bowl at a sushi place that costs $5.